Home / bagel / bakery product name / bialy / Bialystok / cebularz / generric mark / Lublin / pita / A bagel is a bagel is a bagel, and a pita is a pita is a pita: but is a bialy a cebularz? A bagel is a bagel is a bagel, and a pita is a pita is a pita: but is a bialy a cebularz? Generic names are not usually at the top of the agenda of trademark professionals, which is too bad. There may be little to be pondered about why "table" is a generic name for… well, a table. But when the product is tied a specific place, or relates to a certain population, the backstory for the name can get a lot more interesting. Consider the fate of the bread product known as a “bialy”. First, some background: This Kat is planning a visit to his paternal ancestry in northeast Poland. In inspecting the map, he realized that the closest big Polish city is Bialystok. When you are this Kat's age and grew up in the Eastern part of the US, the name Bialystok conjures up the name of a bread product from his youth known as a "bialy". A bialy from Bialystok—got it? But that was decades ago. What about the bialy and the persistence of its name today? All of which took this Kat beyond the world of the pita and bagel to the Polish bread delight, the cebularz. Is your mouth already watering? Read on. [n]o one born Bialystok can forget kuchen. Rich Jews ate kuchen with meals and for poor Jews, the kuchen were the meal”. By the end of World War II, there was no longer any Jewish presence in Bialystok, but those who scattered, especially to New York, had attempted to preserve the tradition of the bialy, albeit removed from its place of origin. 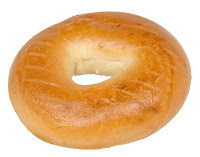 (One friend of this Kat from the same era, who grew up in Jewish London, has no awareness of the bialy.) 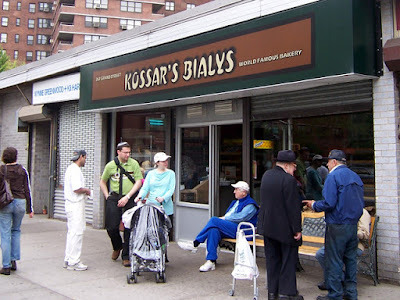 While there is still a pale remnant of the bialy roll that is still available in New York (Kossar’s Bialys being the best known), its presence has seriously diminished, now more the subject of nostalgia than gastronomy. But that is not all. It seems that while the roll, under the name “bialy”, failed to flourish once it was removed from its situs in Poland, there is a highly similar roll, called the “cebularz”, which remains popular in Poland till this day. Here, as well, the roll derived from the 19th century Jewish community, this time those living in the Polish city of Lublin (250 kilometers south of Bialystok). Whether the Bialystok and Lublin versions were the result of interaction between the two communities, or we talking about independent creation, is not clear. Kat friend Ewa Kacperek explains (this Kat hope that he got it right) that the cebularz derives its name from the Polish word for "onion", which remains the principal garnish of the depressed middle of the roll. Even in the absence of the Jewish community in Lublin, not only has the cebularz roll remained popular, but it has flourished. Indeed, in 2014, cebularz, in the form "cebularz lubelski" (emphasizing its connection with Lublin), was registered with the European Commission as a Protected Geographical Indication (PGI) for bread and other bakery products. A PGI registration typically consists of the name of a specific food product that (i) comes from a specific area; (ii) has a specific characteristic attributable to that region; and (iii) at least one of the stages of production takes place in that region. The bialy is now mostly the stuff of nostalgia. Barbra Streisand in “Funny Girl” talks about” a bialy/bagel” just before she sings "I'm the greatest star” (thanks to Kat friend Ellen Shankman for this). Food critic Mimi Sheraton chronicled the nostalgic fate of the bialy in her 2000 book, “The Bialy Eaters: The Story of a Bread and its Lost World”. To the contrary, the cebularz remains a staple of gastronomic life, at least in parts of Poland. After the Second World War and the Holocaust, Christian bakeries like „Kuźmiuk”, which reopened right in 1945, continued to bake the once Jewish specialty. But for years, inhabitants were remembering the Jewish bakers for the quality of their work (s. works of the local historian, Marta Kubiszyn). This suggests several things: First, non-Jewish bakeries continued to bake the cebularz in Lublin, which apparently was not the case in Bialystok. 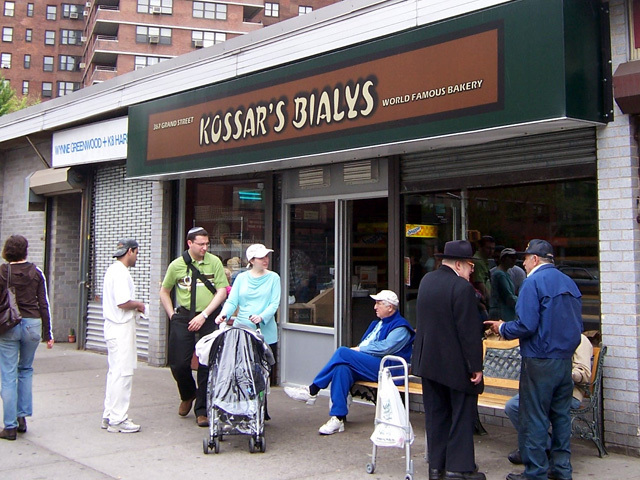 Second, the bialy was, at the end of the day, ultimately tied to its geographical origin. Detached from that, the product name only managed to limp along in America. By contrast, the cebularz maintained its connection with Lublin and thereby flourished. 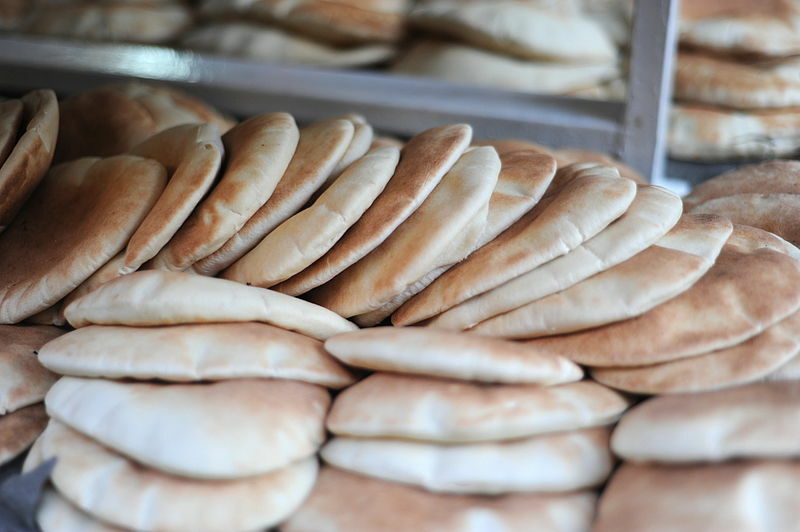 The moral is that the likelihood that a bakery food product will be able to transcend its geographic origin, such as the pita (which goes back far in time and whose geographic origin is anyway uncertain), or the bagel (which does not seem to have been tied to any single place in Europe) has done, is low. It does not hurt that the pita is the perfect baked goods receptacle, while the bagel can be made in a myriad of tastes. No matter: nostalgia for the bialy is not enough-- just compare it with the cebularz. Photo at upper right by Yusuke Toyoda and is licensed under a Creative Commons Attribution-Share Alike 2.5 Generic license. Photo at middle left by Guillaume Paumier and is licensed under Creative Commons Attribution 3.0 Unported license. Photo at lower left by MOs810 and is licensed under Creative Commons Attribution-Share Alike 4.0 International license. What a fantastic and interesting post! I’m soo hungry now. I cant help thinking about Mel Brookes “the producers” Bialystock and Bloom.